Can you have a fully functioning outdoor fireplace on a deck? This deck has an outdoor fireplace and a television outside too! Perhaps it’s because of the proximity of wood to outdoor fire features that elicits questions about whether these spaces can live harmoniously, and safely, next to each other. 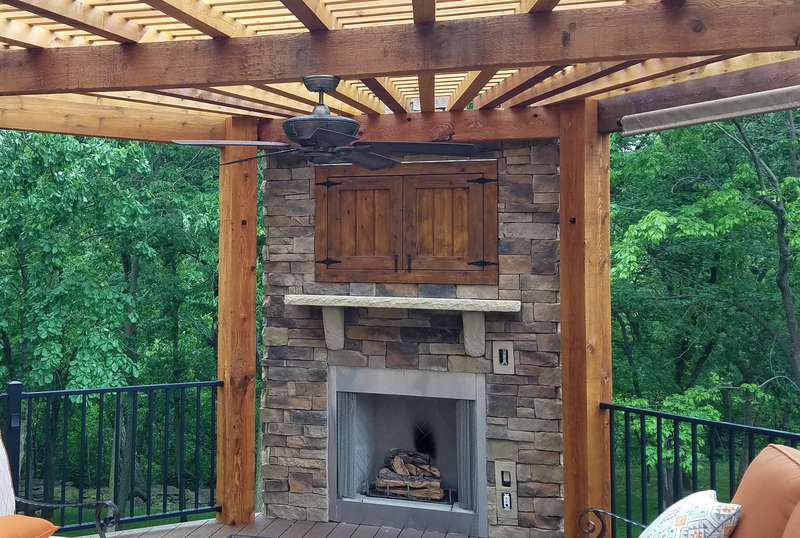 This stunning new fireplace sits atop a low-maintenance AZEK deck, has stunning cedar columns to each side and a wood pergola atop. While it is possible to have wood close to your firepit, it’s critical that it’s built safely by a qualified and licensed builder that will pull all the permits and ensure all the inspections are completed. As we zoom in on this outdoor fireplace, you’ll notice not just the adjoining pergola but loads of small details. Here are just a few of the great design details. The fireplace is a gas insert firebox with a cultured stone facade. Genuine stone corbels hold up a stone mantle. Behind the built-in closet doors is an outdoor TV. Built into the face of the outdoor fireplace are a couple outlets. Once you start to really live outside, you’ll want to be able to plug in your laptop, portable speakers, a lamp, perhaps a heater and maybe even a smoothie maker. Importantly, the choices are yours and they’re endless since this space is wired to accommodate your needs and desires. Mounted below the pergola is a large ceiling fan to circulate fresh air in the deck area. Mounted atop one upper edge of the pergola is a rolled screen which can be used for privacy or temporary sun protection. At Archadeck of Kansas City, we will work with you to understand how much sun you want in your new space and help design the space to suit those needs. How will it look from all sides? When adding an outdoor fireplace to a structure such as a screened porch, open porch, deck or patio, you’ll want to think about how it looks from the front and from the back. 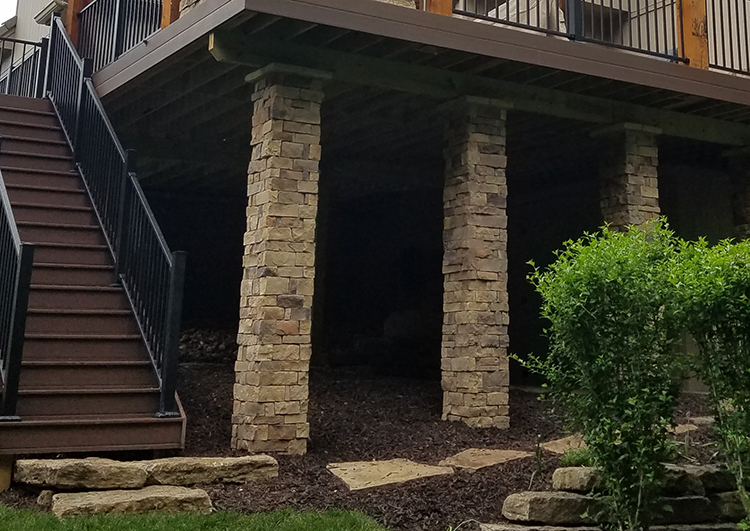 These Winterset Woods homeowners not only took into account how the backside of the fireplace would look, but also considered how the columns that support the large and elevated deck would look. Just as the fireplace wall is faced with stone, the oversized stately columns are wrapped with the same stone. Above is a close-up picture of the columns that support the deck. Notice how well the stone-wrapped columns complement the large stepping stones at the base of the stairs and down the path. Take a look at how these colors work together. The AZEK decking is a rich dark brown color. Both the black railings and the white stone serve in stark color contrast but work beautifully together. Notice the edge banding for the side of the deck ensuring no unsightly joists are in plain view. Are you considering adding an outdoor fireplace to your new deck or porch? 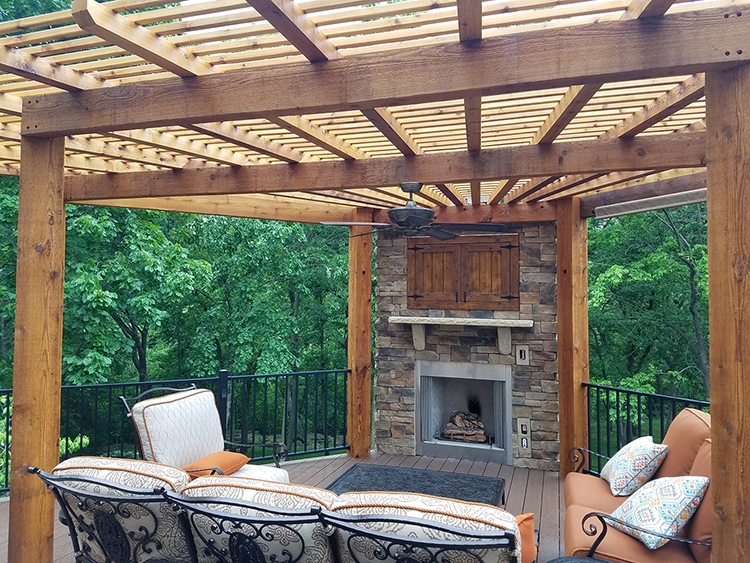 If you’re thinking about adding a new outdoor living space to your Kansas City area home, give us a call for a free consultation. 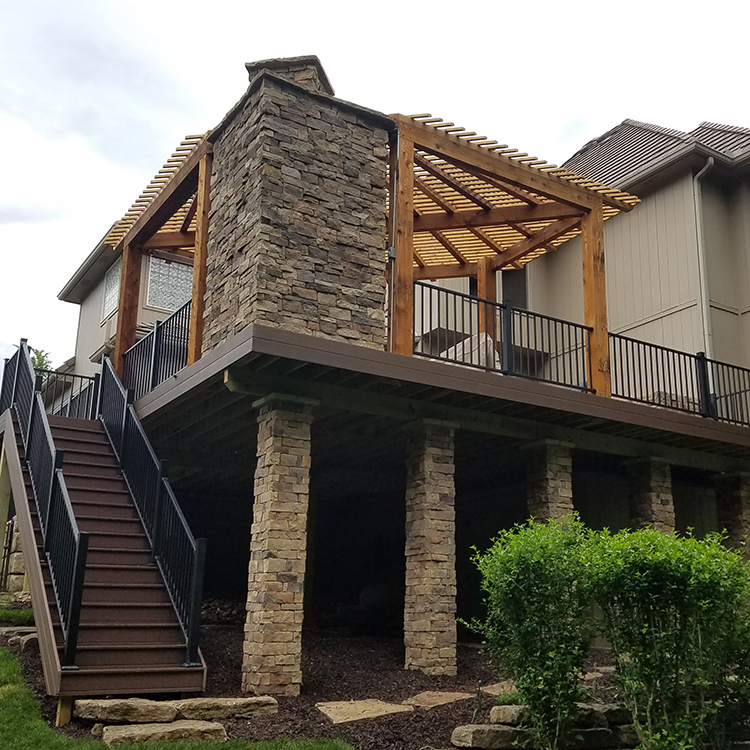 We’ve built hundreds of outdoor living spaces for homeowners throughout the KS and MO areas within the Kansas City metro market. Give us a call at (913) 851-3325 or email us. Take a look at our outdoor fireplace and firepit photo gallery or read more about outdoor fireplaces on our website. We look forward to your call.